The United Way of Coastal Fairfield County has provided a $30,000 grant to STAR, Inc., Lighting the Way… Funds will go to STAR's Birth to Three Services offered at the STAR Rubino Family Center located in Norwalk. Rubino Family Center provides early intervention services designed for children with developmental and health related needs including autism, Down syndrome, significant prematurity and other developmental delays. "The work we are doing here is so important for families in Mid-Fairfield County. Statistics show that over 35% of the children who receive early intervention services are able to reach their developmental milestones by age three and not require further services. We are so grateful to the United Way of Coastal Fairfield County for their support that helps us continue our work within the community," said Barbara Fitzpatrick, Director of STAR Rubino Family Center. STAR, Inc., Lighting the Way is a not–for-profit organization serving infants, children and adults with developmental disabilities, as well as providing support services to their families. We create opportunities for individuals to live full lives with independence, freedom of choice and personal growth by providing support, services and advocacy. We inform and encourage the community to recognize and appreciate the value of all individuals. 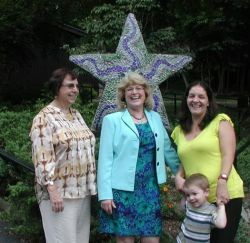 For additional information about the Rubino Family Center at STAR, Inc., Lighting the Way call Director Barbara Fitzpatrick at 203-855-0634 or visit STAR's website at http://www.starinc-lightingtheway.org/. The United Way of Coastal Fairfield County advances the common good by creating opportunities for a better life for all. They focus on the building blocks for a good life: quality education that leads to a stable job, enough income to support a family through retirement, and good health. To accomplish this, they energize and inspire people to make a difference; reflect the diversity of the communities we serve; act as leader and trusted partner in crafting human care strategies within and across our communities; increase investments in these strategies by expanding and diversifying development efforts and supporting the efforts of others; measure, communicate about, and learn from these efforts.